I should say right off the bat that I never would have ended up on vacation in Camden, Maine this past August- and enjoyed all of these wonderful meals- if it weren’t for Nancy Harmon Jenkins‘ sage advice. So really, I am indebted to her. That being said, if you’re interested in seeing Maine through her eyes (and stomach! ), check out her website. There’s no better person for this. I grew up going to the Lakes Region of Maine, to a town we affectionately referred to as “Stinkin’ Lincoln,” thanks to the memorable aroma of its paper mill. Although in the same state, this area is as different from the Midcoast as Tennessee is from Connecticut. And so I arrived in Maine a few weeks ago as a newcomer. For dinner that first night, we joined Nancy and her daughter Sara Jenkins, the talented Chef owner of Manhattan’s Porchetta and Porsena. (Their book The Four Seasons of Pasta will be released on October 6 – I cannot wait to read it). 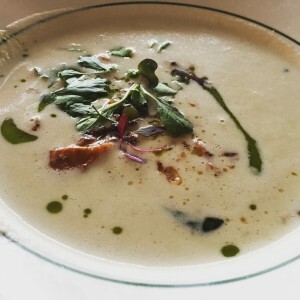 We dined at Francine Bistro in Camden where Chef and owner Brian Hill serves a daily menu based on whatever is best locally. We enjoyed a long long meal of squash blossoms, steak, pork ribs, beef (we shared!) and plenty of wine. I especially enjoyed this simple jewel: sweet corn soup topped with chanterelles. A stunning showcase for the taste of native corn, with just enough cream and butter to complement it, topped with crunchy and nutty chanterelles. We stayed that week at a lovely place called the High Tide Inn, perched atop a hill with a winding road down to a rocky beach. Aside from the water views, my main attraction to this place was the fact that the innkeeper Jo Freilich serves fresh homemade popovers for breakfast. 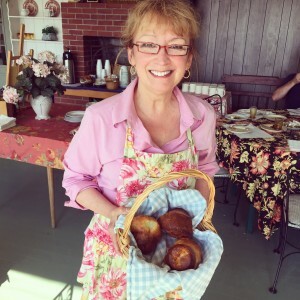 Each and every morning, she bakes trays full of air-filled, light as a feather, glorious popovers. With plenty of butter and jam on the side. 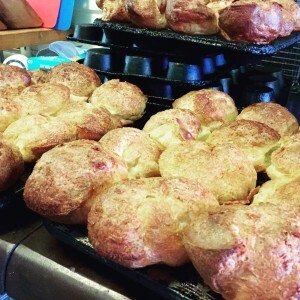 The popovers did not disappoint. Reader, they were as wonderful as I hoped. A browned, crusty exterior, a hollowed center that was light and moist. After an afternoon tour of Camden Harbor and Penobscot Bay on the “Lively Lady,”which included pulling up a lobster trap and learning more about which are kept and which are returned to the water, it was convenient to stop by the pub at Cappy’s Chowder House, a family owned institution in Camden. The “Lively Lady” tour had me in the mood for lobster and so I opted for the day’s special:spicy lobster tacos. 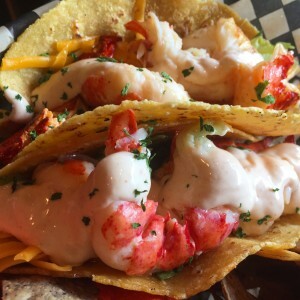 The lobster was fresh and perfectly cooked, served in fresh corn tortillas with just the right amount of spicy creme – enough for good heat, but not so much that it drowned out the lobster. Next up, a stop at the historic Moody’s Diner in Waldoboro. 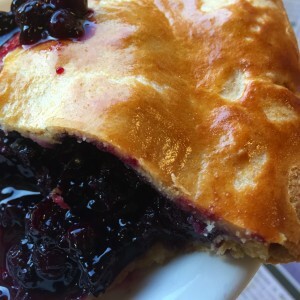 This roadside spot (established in 1927) is known for its whoopee pies, but since blueberries were irresistibly in season, I tried the blueberry pie- spectacular! I’ve served as a judge for a pie contest before and tasted more blueberry pies than I can count. 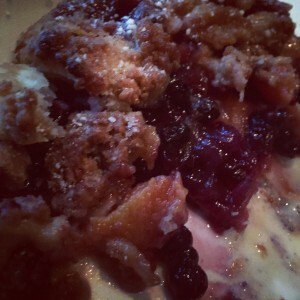 I can’t speak in an educated way about what makes a blueberry pie just right. But as United States Supreme Court Justice Potter Stewart famously said,”I know it when I see it.” And this was it. 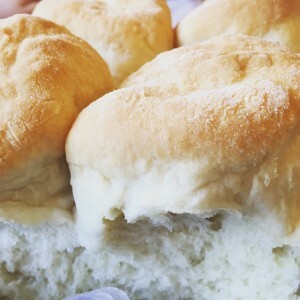 Also of note at Moody’s were the piping hot, just-right salty biscuits, no gravy required. lives on the property and cooks in a small freestanding kitchen with a take-out window. He spent time working in restaurants in West Hartford and Portland and knows how to prepare local seafood the best way possible- simply. 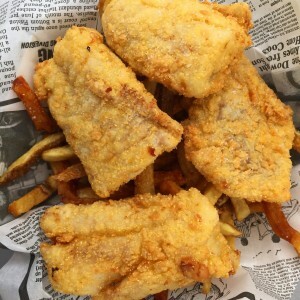 I loved my fish and chips made with Port Clyde Haddock. Yardbird even has a nice little beer and wine list, which adds to the warm communal atmosphere under the white tents where diners enjoy their food. On the way back from Marshall Point, we stopped at the restaurant I had most anticipated – Melissa Kelly’s Primo. Although Kelly has become more widely known since winning a James Beard award in 2013, she has spent 15 years making Primo the extraordinary vision that it is. The restaurant sits amidst acres that house both gardens and animals that supply the kitchen. I talked briefly to Kelly on my way in (there were 50 people in line by the time the doors opened!) — Kelly was arm deep in preparing the evening’s fish– she spoke with the energy and passion of someone who has only just embarked on a mission of love. And that’s the way the food at Primo tastes. We opted to sit in the more casual bar area, where- lucky us- we were able to enjoy $1 wild Damariscotta oysters. 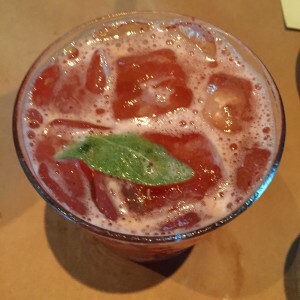 Oceanic love, accompanied by a “Summer Rebel,” prepared with Bulleit Bourbon, strawberry puree, lemon bitters and muddled sage. I had more than one of these. 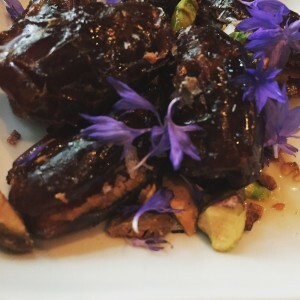 The next dish made my heart beat fast and I think you’ll feel the same just by reading what it was: dates stuffed with Silvery Moon Creamery goat cheese, orange, pistachio, orange blossoms and brandy syrup. Tiny fruits exploding with complex flavor. 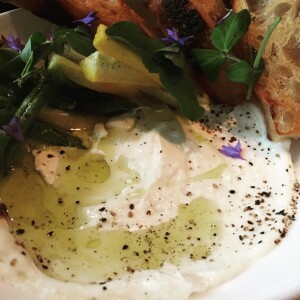 Then a taste of Kelly’s whipped house ricotta, served with some garden greens and zucchini….after full fat, how can we ever go back? Next, arancini with veal. The veal was succulent, and the rice interior al dente. 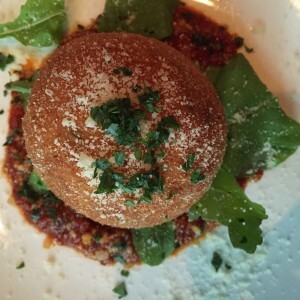 It took me back to my days on Mulberry Street in the Little Italy neighborhood of New York City, where arancini were always made fresh and readily available at the prepared food counter of the local deli. We finished the savory portion of the meal with chicken drumsticks that had been dipped in duck fat, buttermilk and flour, then deep-fried and drizzled with sage honey. 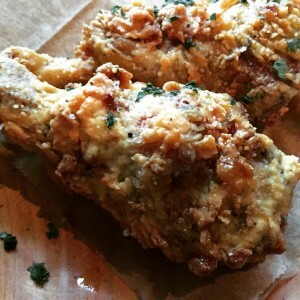 If you love dark meat, you will love these drumsticks. Rich, complex, earthy flavor, accented by the crunchy, fatty exterior- and that splendid sweet topping. Luckily, I saved room for dessert (if can you imagine?!). Again, with wild blueberries in full force, I chose with that in mind and ordered a peach and blueberry crostata with toasted almond gelato. It was an ideal way to end the night- fresh still-firm fruit bursting with flavor- atop crunchy pastry. And that toasted almond gelato was a grown up version of my childhood ice cream truck flavor of choice: The Good Humor toasted almond bar.Delightful. As you can well imagine, I went to sleep sated that night. A small note: I also enjoyed takeout from another of Nancy’s favorite spots- Long Grain in Camden. It was excellent Thai food and I didn’t take a single photograph of it. But if you are in Camden. you should go there. On my very last night, I visited The Slipway Restaurant in Thomaston. My desire for this place was inspired by a photo Nancy posted of fried oysters on Facebook. I usually prefer my oysters raw, since a poorly fried oyster can mask its flavor. But “Nancy’s” oysters looked so incredible that they floated in my brain for months. We sat at a wooden table on a long dock, with a quiet beautiful water view. Some people even arrived by boat while we were there. 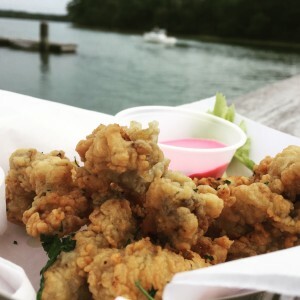 And then they arrived– those famed fried oysters. That night they were served with a beet ginger shallot dipping sauce. 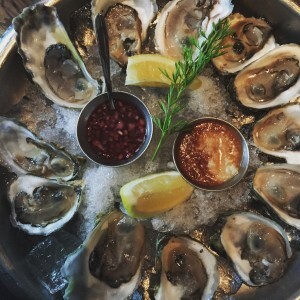 These oysters were magnificent- full of their “oyster” taste- cleanly and flavorfully fried. All kinds of yes. 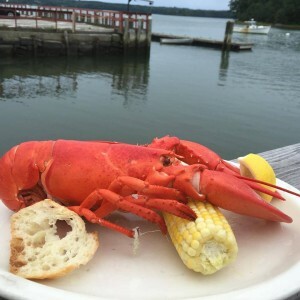 For my entrée on the Midcoast of Maine, I enjoyed my first encounter with soft shell lobster. How have I lived on this earth for 42 years and never tasted this before? Apparently the just-molted soft shells don’t travel well and so it makes sense that I hadn’t tasted them on the Connecticut shoreline or in New York City. If I had access to soft shells always, this is the only kind I would eat. Although the meat yield was less than a hard shell, the reward was great. Sweet, delicate meat. The best I’ve had. And the perfect way to end the week in Maine.